Baking with zucchini really is the perfect way to get fresh GREEN veggies into your diet while still enjoying your favorite foods! I mean your kids and hubby won’t even notice you’ve added them because zucchini has absolutely no flavor when mixed in with bread and chances are they’re going to ask for seconds. For those of you who have never used zucchini before in your baking, one of the things I love the most is that shredded zucchini really makes your bread (or cake) super moist!! The Greek yogurt too makes the crumb super moist. Moisture is usually sacrificed when fat (the oil) is reduced, but the Greek yogurt’s all like I got this. 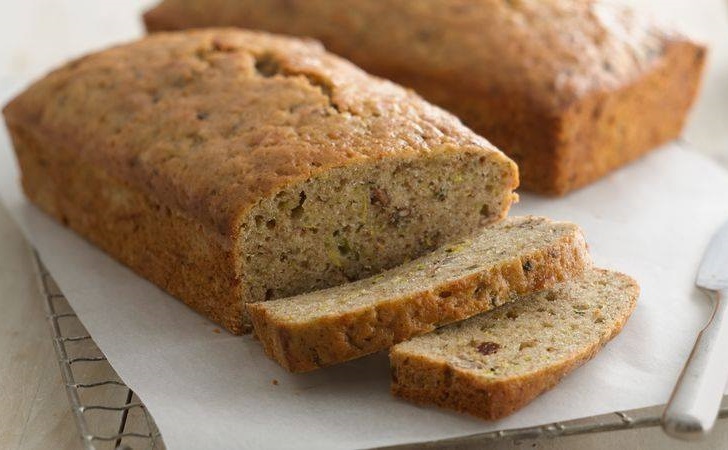 Below is the recipe on how to make a loaf of healthy zucchini bread with Greek yogurt. ⏩Preheat oven to 350°F. Prepare an 8″ x 4″ loaf pan with oil or parchment paper. ⏩In a large bowl, whisk together flours, baking powder, baking soda, cinnamon, nutmeg, and salt until combined. ⏩In a medium bowl, mix together egg, yogurt, coconut oil, honey, brown sugar, and vanilla then add grated zucchini. ⏩Fold in flour mixture until all combined and pour mixture into prepared loaf pan. ⏩Bake for 45 min to an hour or until a toothpick inserted in the middle comes out clean. ⏩Remove bread from the pan and allow to cool on a wire rack for about 10 minutes. Slice and enjoy!